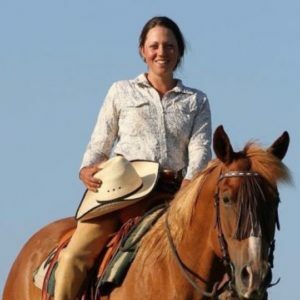 Editor’s Note: Amy Skinner is a regular guest columnist and has been a horse gal since age six. She presented with fellow trainer and rider, Katrin Silva, at the Best Horse Practices Summit. She rides and teaches dressage and Western. 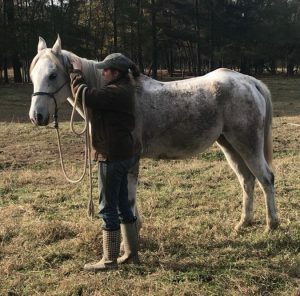 Skinner has studied at the Royal Andalusian School of Equestrian Art in Spain, with Buck Brannaman, Leslie Desmond, Brent Graef, and many others. Check out Amy’s website here. Why doesn’t my horse want to get caught? Next to trailer loading, catching a horse is one of the most frequent scenarios in which we lose our emotional control. Every horse owner knows the frustration: you go out to catch your beloved horse, and he wants nothing to do with you. He turns tail and runs. There are many popular methods for catching a hard-to-catch horse: bribing with treats to chasing a horse until he “chooses” to get caught. But when catching horses, it’s important to invest in the process and consider what you’re teaching in those moments. Chasing a horse who is hard to catch is counter-productive. If he’s running out of fear, chasing him adds more fear. If he’s running out of habit, chasing him encourages that habit. Some people say they are giving the horse the choice between being run and choosing to be caught. Imagine using that tactic on a friend. They don’t want to be near you, so you say, either you let me be near you, or I am going to make your life unpleasant. It doesn’t sound too good, does it? They might choose to get caught when their lungs are burning, but they haven’t stopped because they want to be caught. They just don’t want to be uncomfortable anymore. It would break my heart if my friends didn’t want to be around me. But punishing them would only make the situation worse. I would need to look at WHY they don’t want to be around me. 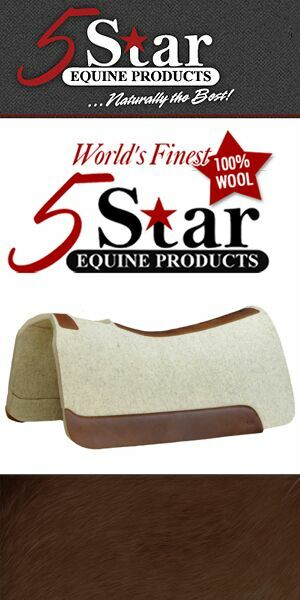 So why doesn’t your horse want to get caught? Your approach to catching them doesn’t work for them. You may be walking in too fast, too hard, or haltering them in a way that irritates or just doesn’t fit. They may associate you or people with fear, drudgery, and pain. It may be habit for them to leave you during catching. Refusing to get caught has nothing to do with disrespect or poor behavior. Teaching a horse to be caught softly has everything to do with human approach. So how do you catch that horse who offers you his tail? When catching a horse, I ask myself what I want the horse to be learning. I want them to learn to draw in to me, to find relief and relaxation with me, and, most importantly, to build a relationship. 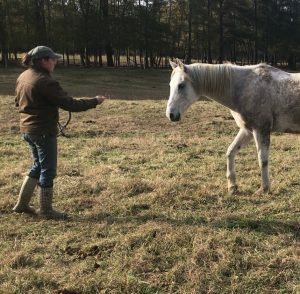 When I go to catch a horse that might be worried or uninterested, the first thing I want to do is teach them to engage and become interested. I’ll reward this horse by taking the pressure off (leaving them entirely or just a little, depending on the horse and the moment) any time they tune in, in other words look toward me, or step toward me. Kevin is an example of a once hard-to-catch horse. Kevin was older, without much handling and was suspicious and scared to death of nearly everything. Catching him could be tricky. When I went into the pen to catch him, I made sure I didn’t move too quickly. But I also made sure I wasn’t too still. I moved as fluidly as I could. When I entered his pen, he would snort and trot off. Rather than chase him off, I would quietly follow him, keeping my energy in a “following” feel, so as not to push him more. I kept my footsteps soft. I tried to see where Kevin was going to go next, and sometimes get there first. When Kevin looked toward me or became curious, I would back up. Repetitions of this action cemented the “draw.” My goal wasn’t to catch Kevin until he was ready to be caught. My goal was to teach Kevin to become interested. Sometimes, Kevin would step toward me. If this happened, I would back up. Eventually, he started to follow me, and if I stopped, he came up behind me and would investigate and sniff me. This built his confidence. Chasing or approaching head-on would have been entirely too much pressure for him, and counter-productive. Once I could approach him, I prepared him for being touched by “air petting” his face without actually touching him. In this way, he wouldn’t be alarmed by my reaching out toward his face. As I moved closer, my hand made contact with his face without any change in the motion of my arm, and he didn’t worry. Then, I prepared him for the look and feel of being haltered by doing the same on the side of his face, under his jaw and above his ears. I wanted to keep things smooth so that no part of the process scared him or gave him reason to lose trust. After some time, catching Kevin became easy. But I maintained that ease by making sure every session with him ended in relaxation of mind and body, and that when I turned him loose, I didn’t scare him off. As I unhaltered him, I made sure to draw him in and walked away before he did. I try to constantly reward the draw, and once that became habit, Kevin was solid to catch. But it isn’t enough to just teach horses how to be caught. We need to make sure every time we work with them, we leave them feeling positive, relaxed, and better than when we found them in the pasture. 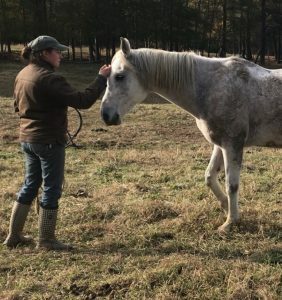 I want them to think when they see me, “there’s the person who makes me feel better than eating grass with my friends.” If you know anything about horses, that’s a tall order, but it’s a challenge I found worthy of my time. Wow, this is such a beautiful article and so timely for Ginger and I!! Thank you for writing with elegance, grace and ease.